By the time Nate Fisher was laid to rest in a woodland grave sans coffin in the final season of Six Feet Under, Americans all across the country were starting to look outside the box when death came calling. 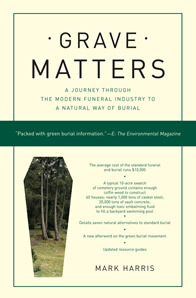 Grave Matters follows a dozen such families who found in “green” burial a more natural, more economic and ultimately more meaningful alternative to the tired and toxic send-off on offer at the local funeral parlor. Eschewing chemical embalming and fancy caskets, burial vaults and costly funerals, they have embraced a range of natural options, new and old, that are redefining a better American way of death. Environmental journalist Mark Harris examines this new green burial underground, leading you into natural cemeteries and domestic graveyards, taking you aboard boats from which ashes and memorial “reef balls” are cast into the sea. He follows a family that conducts a home funeral and delivers a loved one to the crematory, another that hires a carpenter to build a pine coffin. In the morbidly fascinating tradition of Stiff, Grave Matters details the embalming process and the environmental aftermath of the standard funeral. Harris also traces the history of burial in America, from frontier cemeteries to the billion-dollar business it is today, reporting on real families who opted for more simple, natural return. Copyright © Mark Harris. All rights reserved.